Interest in tackling climate change in the United States has increased somewhat recently in response to global CO2 atmospheric concentrations reaching 400 ppm, although there is almost no hope of new federal legislation soon. Many claims have been made recently that increased use of natural gas is an important element in any US response to climate change. In this regard, the natural gas industry has made a considerable effort to convince citizens that natural gas from hydraulic fracking is part of the solution to climate change. As an example, the following is from a gas industry website. Because carbon dioxide makes up such a high proportion of U.S. greenhouse gas emissions, reducing carbon dioxide emissions can play a pivotal role in combating the greenhouse effect and global warming. The combustion of natural gas emits almost 30 % less carbon dioxide than oil, and just under 45 % less carbon dioxide than coal. One issue that has arisen with respect to natural gas and the greenhouse effect is the fact that methane, the principle component of natural gas, is itself a potent greenhouse gas. Methane has an ability to trap heat almost 21 times more effectively than carbon dioxide. According to the Energy Information Administration, although methane emissions account for only 1.1 % of total U.S. greenhouse gas emissions, they account for 8.5 % of the greenhouse gas emissions based on global warming potential. Sources of methane emissions in the U.S. include the waste management and operations industry, the agricultural industry, as well as leaks and emissions from the oil and gas industry itself. A major study performed by the Environmental Protection Agency (EPA) and the Gas Research Institute (GRI), now Gas Technology Institute, in 1997 sought to discover whether the reduction in carbon dioxide emissions from increased natural gas use would be offset by a possible increased level of methane emissions. The study concluded that the reduction in emissions from increased natural gas use strongly outweighs the detrimental effects of increased methane emissions. More recently in 2011, researchers at the Carnegie Mellon University released “Life cycle greenhouse gas emissions of Marcellus shale gas”, a report comparing greenhouse gas emissions from the Marcellus Shale region with emissions from coal used for electricity generation. The authors found that wells in the Marcellus region emit 20 percent to 50 percent less greenhouse gases than coal used to produce electricity. Carbon dioxide (CO2) emissions from energy use in the first quarter of this year fell to their lowest level in the U.S. in 20 years, as demand shifted to natural gas-fired generation from coal-fired electricity due to record low gas prices, the energy department said. 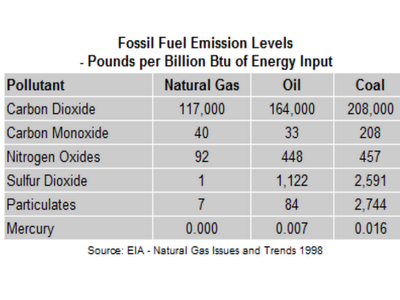 The following chart shows the amount of pollutants including CO2 from natural gas, oil, and coal combustion. As we can see from this chart, natural gas combustion as a source of electricity generation produces about 70 % of the CO2 as oil and 56 % of the CO2 compared to coal without including methane leakage amounts, a matter discussed below. Yet controversies remain about whether natural gas should be understood as a solution to climate change and if so to what extent. This article first identifies the controversies and then reviews these issues through an ethical lens. Two controversies about the efficacy of switching from coal to natural gas combustion in the production of electricity need to be resolved before conclusions on the beneficial effects of natural gas in reducing ghg emissions can be made. These controversies are: (a) Lingering issues about methane leakage rates, and (b) The inability of current natural gas combustion technology to achieve the magnitude of ghg emissions required to prevent dangerous climate change particularly in the medium- to long-term. Natural gas is mostly methane, a potent ghg. 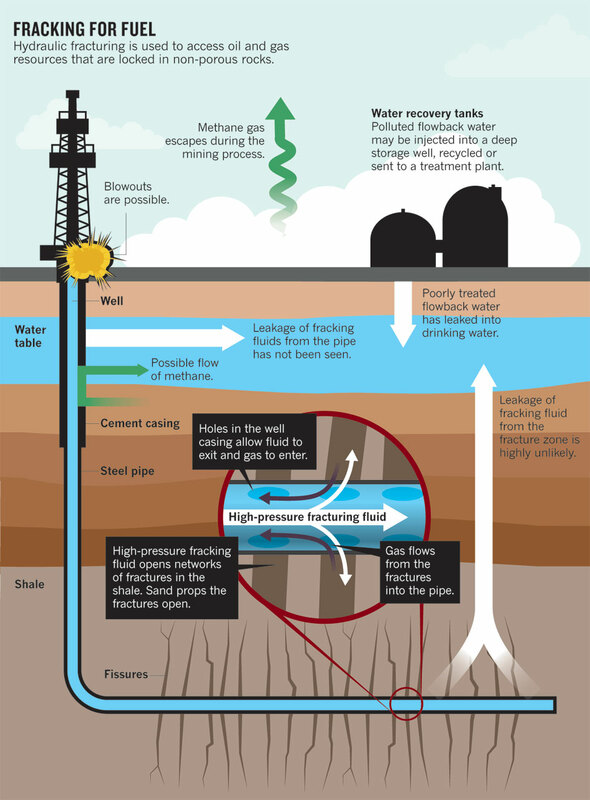 Natural gas production from hydraulic fracturing is known to leak methane. It is usually assumed that replacing coal with gas would reduce greenhouse gas emissions as long as the leakage of methane into the air from gas production does not exceed 3.6%. (Reuters, 2012) Yet significant controversies remain about actual methane leakage rates. In this regard recently there has been a flurry of conflicting papers about methane leakage rates from natural gas production. For instance, US EPA concluded that methane leakage was 2.4% of total natural-gas production in 2009. Other recent studies have found leakage rates of 4% and 9% from hydraulic fracturing operations in Colorado and Utah. (Tollefson, 2013) As a result, no rational climate change action plan or ghg inventory should ignore controversies about methane leakage from hydraulic fracking operations. Until methane leakage rates are scientifically determined, any ghg inventory or projection of future emissions should identify the range of leakage rates that appear in the extant literature. In addition to leakage rates from natural gas production facilities, methane leakage is also known to occur in natural gas transmission lines as well as from vehicles powered by natural gas and other end uses of natural gas. Therefore, actual methane leakage rates into the atmosphere from natural gas need to be based on the sum of leakage from all of these sources that include production, transmission, and end use. Because methane leakage rate controversies are not yet resolved, any climate change action plan must be transparent about the limitations of predicting ghg emissions from natural gas consumption and fully identify all uncertainties about leakage rates. And so, the challenge facing the world to limit future warming to tolerable levels is extraordinarily daunting and will likely require a level of global cooperation far beyond any other previous human problem. Stabilizing atmospheric concentrations at levels that will avoid dangerous climate change requires immediate action. The entire world will need to peak its ghg emissions as soon as possible followed by emissions reductions at extraordinarily ambitious rates over the next 30 years. The longer it takes for world ghg emissions to peak and the higher ghg emissions levels are when peaking is achieved, the steeper global emissions reductions need to be to prevent dangerous levels of warming. The following chart shows the emissions reduction pathways that are needed in this century to give the world any reasonable hope of limiting warming to 2°C, assuming global emissions continue to rise at current levels during the next few years. And so it is clear that the later the peaking of total global emissions, the steeper the reduction pathways that are needed. This is so because according to a recent International Energy Agency (IEA) report, natural gas can play at best a limited, very temporary role “if climate objectives are to be met.” That is, greater ghg emissions reductions are needed to prevent 2°C warming than those that can be achieved by switching from coal to natural gas combustion. And so most observers argue that the only viable response to the threat of catastrophic climate change is rapid deployment of existing carbon-free technology. (IEA, 2012) Even if natural gas combustion creates a 50 percent less CO2 per unit of energy produced, an amount which is beyond best case on ghg emission reductions, it will not produce the greater emissions reductions necessary in the next 30 years necessary to give any hope of restricting warming to potentially catastrophic levels. In short, natural gas combustion cant get us where we need to be just a few decades out. It might help in the short term, but we need massive investment in non-fossil technology as soon as possible. In addition if coal combustion were to be replaced now by non-fossil fuel energy, it would help immediately much more than conversion of coal to natural gas combustion does with putting the world on an urgently needed ghg emissions reduction pathway that gives more hope of preventing catastrophic warming. There are also other significant benefits of moving quickly to non-fossil fuels. For instance, according to IEA report, fuel savings from investment in non-fossil fuel technologies will pay for the investments. (IEA, 2012) Even if natural gas is a short-term bridge fuel, delay in investing in non-fossil fuel technologies may make it impossible to meet the emissions reductions targets needed to prevent dangerous climate change. For this reason, any climate action strategy must look at emissions reductions pathways beyond 2020 necessary to limit warming to 2oC and consider what amounts of non-fossil energy are needed through 2050. Because huge amounts of non-fossil energy will very likely be required to allow the United States and other developed nations reduce their carbon foot-print to levels required to meet their fair share of safe global emissions, the more rapid the ramp up of non-fossil energy the easier it will be to reach acceptable ghg emissions levels in the years ahead. Furthermore, the IEA report makes it clear that abundant cheap natural gas could push renewables out of the market unless there is a price on carbon or aggressive economic support for non-fossil renewable energy. It is also possible that cheaper natural gas prices may lead to higher rates of consumption of electricity creating higher CO2 emissions. For this reason, any reliance on natural gas combustion as a method of reducing CO2 emissions must provide for ramped up commitments to non-fossil fuel sources of energy at levels needed to prevent dangerous climate change. Reliance on natural gas alone will not achieve the 80%-95% reductions required of developed nations to prevent dangerous climate change. Barriers to much more aggressive use of non-fossil combustion appear to be a lack of political will coupled and arguments about prohibitively high costs of non-fossil energy. We will now examine these issues through an ethical lens. Natural gas hydraulic fracturing technologies have created issues about social and environmental impacts that are beyond the scope of this article. Here we more narrowly examine ethical questions raised by reliance on natural gas as a solution to climate change. Depending on how the methane leakage controversy is resolved, switching from coal combustion to natural gas combustion could help lower ghg emissions from the electricity sector in the short term. Given that the United States has strong ethical responsibilities to rapidly reduce its carbon footprint, a matter examined extensively in Ethicsandclimate.org, one might initially conclude that as a matter of ethics switching to natural gas from coal combustion is ethically justifiable as a short-term strategy. Yet, undeniably replacement of coal combustion with non-fossil energy would create a much greater reduction in the long run in the US carbon footprint than a shift to natural gas from coal combustion would alone. As we noted above, objections to moving immediately to non-fossil energy are lack of political will and cost arguments. We now look at these political and cost arguments through an ethical lens. No reasonable ethical theory could justify current US projected ghg emissions, including projected reductions that are expected to come from increased substitution of coal with natural gas at least in the medium to long term. This is so for many reasons including, first, as we have explained in considerable detail in the recent article on climate change equity, US emissions far exceed global averages in per capita emissions, the US is by far the largest contributor to historical emission which have raised atmospheric concentrations of CO2 from approximately 280 ppm to 400 ppm, and the world is now running out of time to limit warming to non-dangerous levels. Because, as we have demonstrated in the recent article on “equity” and climate change, there are approximately 50 ppm of CO2 equivalent atmospheric space that remain to be allocated among all nations to give the world approximately a 50% chance of avoiding a 2oC warming and developing nations that have done little to elevate atmospheric CO2 to current levels need a significant portion of the remaining atmospheric space , high emitting developed nations need to reduce their emissions as fast as possible to levels that represent their fair share of the remaining acceptable global budget. (See On the Extraordinary Urgency of Nations Responding To Climate Change on the Basis of Equity.) For this reason, high-emitting nations have strong ethical duties to reduce their ghg emissions as fast as possible to their fair share of safe global emissions. Without doubt, this means that the United States has an ethical duty to reduce emissions both in the short and long run faster than switching to natural gas combustion from coal sector will allow by itself. The actual amount of emissions reductions that are needed between now and 2020 is somewhat of a moving target depending on the level of uncertainty that society is willing to accept that a dangerous warming limit will be exceeded, the most recent increases in ghg emissions rates, and assumptions about when global ghg emissions peak before beginning rapid reduction rates. One new study shows that we have to reduce emissions even more than scientists initially thought in order to avoid climate change’s worst impacts. A paper published in Energy Policy on February 20, 2013 by Michel den Elzen and colleagues examines new information on likely future emissions trajectories in developing countries. (Ezden, 2013) As a result, the report finds that developed countries must reduce their emissions by 50% below 1990 levels by 2020 if we are to have a medium chance of limiting warming to 2°C, thus preventing some of climate change’s worst impacts. As we have seen above, to stabilize atmospheric concentrations at levels that will avoid dangerous climate change the entire world will need to peak its emissions in the next few years followed by emissions reductions at hard to imagine rates over the next 30 years. No matter what reasonable assumptions are made about carbon budgets that need to guide the world’s response to avoid dangerous climate change, as a matter of ethics, the US has a duty to reduce its ghg emissions both in the short and long run to levels much greater than switching to natural gas combustion from coal will accomplish by iteslf. Although ethical reflection on benefits of short term switching to natural gas reveals the above ethical questions, long-term reliance on natural gas as a climate change solution raises greater issues of ethical concern. This is so because although switching to natural gas combustion from coal can reduce temporarily the US carbon footprint when coupled with the right policy measures, there is no hope that natural gas combustion alone can achieve the huge emissions reductions necessary to put the United States on an emissions reduction pathway that matches the US ethical obligations to prevent dangerous climate change. The United States urgently needs to adopt policies that will ramp up its use of non-fossil energy immediately. Investment in natural gas combustion could delay investment in non-fossil energy. Moreover the amount of non-fossil energy needed to put the US on an emissions reduction pathway consistent with its ethical obligations requires the United States to begin immediately as a matter of ethics. The longer the United States waits to move more aggressively to increase the share of non-fossil energy, the more difficult, if not impossible, it will be to meet non-fossil energy needs a few decades from now. And so as a matter of ethics a strong case can be made that the United States needs immediately to adopt policies designed to aggressively increase levels of non-fossil energy. And so if political will is a barrier to greater use of non-fossil energy, politicians resisting greater commitment to non-fossil energy are most likely supporting positions that fail to pass minimum ethical scrutiny. The fact that much greater US commitments to renewable energy are feasible is demonstrated by looking at achievements of other nations. Germany, for instance, has set a goal of 100% renewable energy in its electricity sector by 2050. (The Gaurdian, 2010) Germany’s Environment Agency’s study found that switching to 100 % green electricity by 2050 would have economic advantages, especially for the vital export-oriented manufacturing industry (The Gaurdian, 2010) It would also create tens of thousands of jobs. Cost arguments are often deeply ethically problematic because they ignore duties, responsibilities, and obligations to others to reduce ghg emissions. That is, cost arguments usually appeal to matters of self-interest and ignore responsibilities to others including the tens of millions of poor people around the world that are already suffering from climate change impacts or who are much more vulnerable to much harsher climate change impacts in the future than the United States is. Cost arguments are ethically problematic if they fail to examine the costs of non-action and only consider the costs to high emitters of reducing ghg emissions. Given that most economists now believe that costs of non-action far exceed costs of reducing the threat of climate change, costs considerations that only consider costs to polluters are both deeply ethically troublesome and radically incomplete. Costs arguments may not be made against climate change policies if greenhouse gas emissions lead to serious human rights violations of victims who have not consented to be put at risk. Cost arguments often translate all values to economic values measured in markets and thereby transform some things that victims hold have sacred value into commodity value. Cost arguments usually ignore issues of procedural justice including the right of victims to consent to being put at risk to climate change impacts. Cost arguments alone usually ignore well settled norms of international law including the “polluter pays” and “no harm” principles that the United States and almost all other nations have agreed to in ratifying the United Nations Framework Convention on Climate Change. In conclusion, we have identified strong ethical arguments that support the need to ramp up non-fossil fuel combustion in the United States and other developed countries while implicitly acknowledging that there could be some short-term benefit if coal combustion is replaced by natural gas, a conclusion that only can be reached with better understanding of the methane leakage issues. Yet even if there is some short-term benefit from substituting natural gas for coal combustion, there is no ethical basis for doing this without simultaneously aggressively ramping up non-fossil fuel electricity combustion. 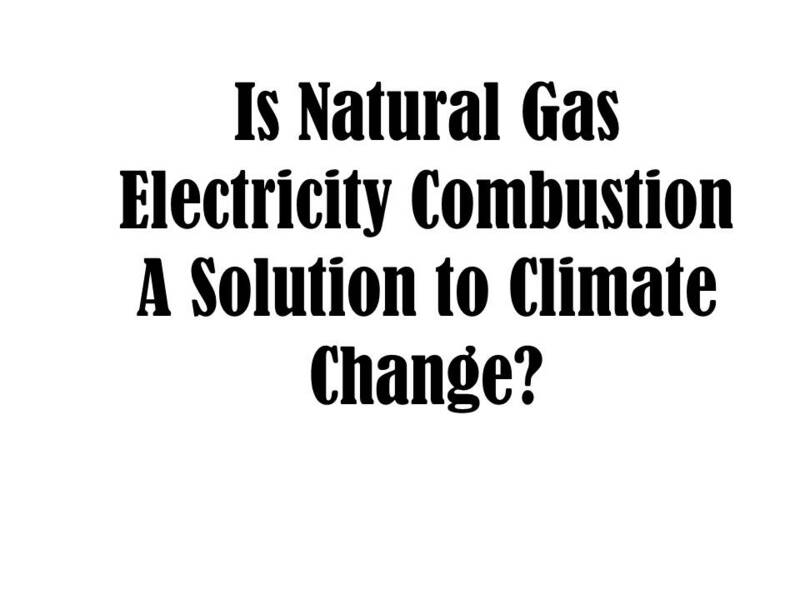 We note that some in the natural gas industry and their political supporters continue to oppose policies designed to ramp up non-fossil fuel combustion at the same time claiming that natural gas is a solution to climate change. Because the failure to ramp up non-fossil fuel combustion Under the circumstances discussed in this article, such opposition is ethically problematic.